SUMMARY of QUALIFICATIONS: Organized, structured individual. Strengths include high-level of adaptability, educational outreach, holistic analysis and application of the Scientific Method within inquiry-based learning. These strengths compliment talents in teaching, integrated project management and interpersonal communication. “Ready To Learn” Trainer for TPT. Certified to train new educators and partners, across the USA, how to implement new, proprietary “Hero Elementary” programming – an innovative digital K – 2nd curriculum which aligns with the Next Generation Science Standards and Core Curriculum literacy guidelines. Founder and Executive Director of an educational 501-c3 Non-Profit Public Charity. Brings Earth Sciences to the forefront of STEM programs in grades K-12 while emphasizing science-based inquiry learning methods through Seismology. Coordinates and hosts major school-wide STEM events, promotes citizen science in our communities and contributes to Educational and Seismological Journals and Conferences. Responsible for all geological operations planning and execution for the Tubular Bells’ Development, Deepwater Gulf of Mexico, ownership of procurement and responsibility of rig geological services; Member of the Pore Pressure Team of Excellence. Worked in all business settings including Exploration, Development, and Production Companies. Project coordination over conventional assets on land and deep offshore. Major technical contribution was subsurface pressure predictions and real-time operations surveillance. 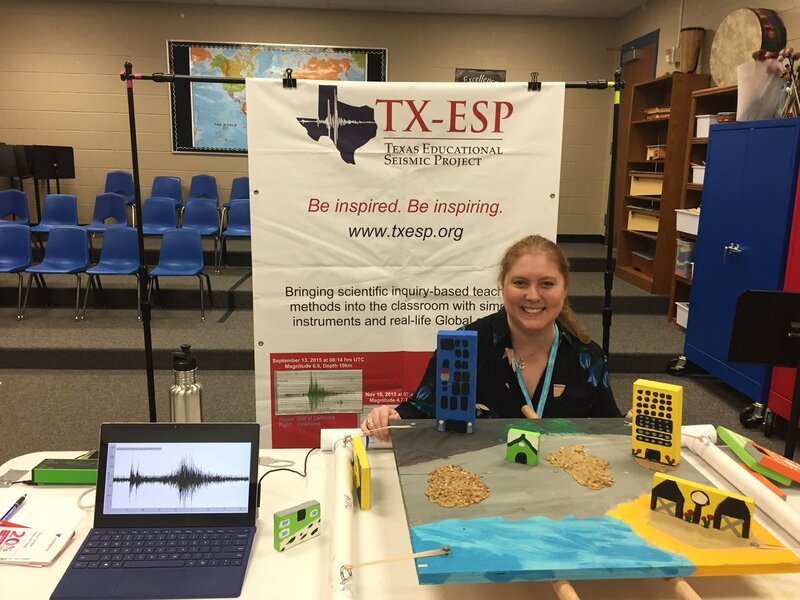 Texas Educational Seismic Project (2014-Present) – Founded and current Director of an educational 501-c3 Non-Profit Public Charity which emphasizes science-based inquiry learning methods thru Seismology and connects it to Public Policies. Recent events – please see txesp.org/events. Historical work includes American Geophysical Union National Conference, Energy Day Houston, State of TX STEM Fair, Girl Scout of San Jacinto, Public Schools’ STEM Fairs, Texas Girls’ Collaborative [STEM] Project UT Austin, girlstart STEM Days, Career Days (via skype) with rural counties. Designed, taught new laboratory instruction for Introduction to Geology/Geophysics, Geoscience and Public Policy, and Weather/Climate and the Environment courses; administered and evaluated student examinations. Fink, K. R., Kafla, A.L. (2019). “Cultivating Citizen Scientists with Seismic Monitoring in Texas and New England Using an Affordable Seismograph”, National Annual Meeting, Society of Exploration Geophysicists, San Antonio, TX, 15-20, September, 2019. (Abstract Submitted). Fink, K. R., Kafka, A.L., A.M. Moulis, and Marilyn Bibeau (2018). “TX-ESP and BC-ESP: A Collaborative Educational Seismology Project in Texas and New England”, National Annual Meeting, American Geophysical Union, Washington D.C., 10-14 December, 2018. (Abstract and Poster Presentation). Fink, K.R. “Exploring the Earth With Seismology.” The Science Teacher, Volume 84, Number 9, December 2017. Kafka, A.L., A.M. Moulis, K.R. Fink, and H.E. Chambless (2016). “Can You Show Us the Richter Scale?”: The Challenge of Teaching About Magnitude With Educational Seismographs, Eastern Section Meeting, Seismological Society of America, Reston, VA, 23–26 October 23-26, 2016. (Abstract and Poster Presentation). Alberty, M. and K. Fink, “Using Connection and Total Gases Quantitatively in the Assessment of Shale Pore Pressure.” Society of Petroleum Engineers, SPE 166188, October 2013. Professional Presentation at American Association of Petroleum Geologists Annual Convention, 2010. Rasmusson, K. N. “Probabilistic Analysis of Social and Economic Losses Due to Large Earthquakes in New England.” Master’s Thesis, Weston Observatory, Boston College, 2003. Kafka and Rasmusson, “Using the AS-1 Seismograph for Laboratory Exercises in an Introductory Geophysics Course: Turning Seismic Moments into Teaching Moments.” Seismological Research Letters, Vol. 74, No. 5, October 2003. Oral Presentation at Eastern Section Seismological Society of America, Annual Conference (Seismological Research Letters), 2002.